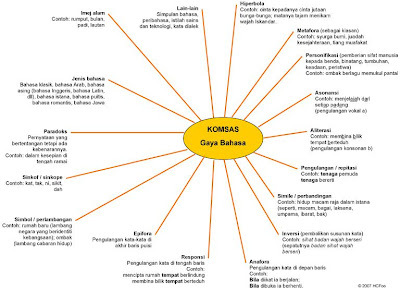 I'm sharing the list of gaya bahasa PMR students have to learn in Komsas Bahasa Melayu. Hopefully this will help some students out there who are struggling with this subject. Teachers too can print out this mind map and give out to their students. Normally I would give out this one-page mind map to my tuition students at the begining of the year. I would first discuss with them the different types of gaya bahasa they must know. Then I would ask my students to find words, phrases or sentences from the novel and anthology that use/apply the gaya bahasa. Once they are familiar with the usage, I would ask them to write their own essay or poem with the condition they must apply some of the gaya bahasa they have learnt. If you are interested to get a .pdf or .doc copy of this mind map, send me an email or drop me your email in the comment page.